It has been a long time since I have posted, but this caught my eye so I figured I would post it. We all know about Ortiz's struggles so far in 2009 (wOBA of .206 and a K% of almost 30%), but his pitch f/x data paints an even bleaker picture. When digging deeper, we can see fastballs are giving Ortiz problems. He is leading the majors in misses against fastballs with 19. Also, the average fastball speed on his misses is only 90.4 mph. This would rank as 130th out of 152 hitters with at least 5 swings and misses. To recap, not only is Ortiz swinging and missing often but he is also missing on fastballs with a low average velocity. Hopefully he can pick it up, or else the Sox will be looking to add a bat in the coming months. A big game tonight as the Rays and Sox start their mid-week series. James Shields faces off against Justin Masterson in what should be a good battle. I have previewed both Shields and Masterson before so here is Shields and here is all the Masterson previews. Using FIP, which is fielding independent ERA, Shields shows up at 3.48 while Masterson comes in at 5.02. That paints a different picture than just looking at ERA, which has Shields at 3.76 and Masterson at 3.43. I was looking forward to Shields last start vs Boston, but unfortunately that didn't last long because of the brawl. Lastly, Keith Law mentioned in a chat the other day that he sees Justin Masterson as a better fit in the bullpen than the rotation, so I'll be taking a look at that to see if I notice anything. If Masterson did move to the pen this year, it would probably be to allow Clay Buchholz back into the rotation. The Sox face Dan Haren tonight, one night after a dramatic walk off home run by Kevin Youkilis. Let us take a look at Dan Haren. Haren throws a fastball, slider, changeup and splitter. His money pitch is the splitter, which one of the best in the game. It has great late bite on it and hitters have trouble making contact on it. Here is his horizontal vs vertical movement chart. As always, it is taken from the catcher's point of view. You can see the great movement on the splitter here. It has as much downward break as his slider, and moves to the pitchers glove side. Normally, splitters don't move horizontally like this, but that just goes to show you how nice the pitch is. Looking at RHB, not only is his splitter impossible to hit, it also has the highest strike percentage. Combine the two and you have one filthy pitch. Example, start 5 was all fastball/splitter while start 12 he went mostly fastball/slider. His changeup is thrown a good amount in some games such as 2, 6, and 11, while the rest of the time he barely uses it. I wonder why that is. Should be a good game tonight. Haren is one of my favorite pitchers to watch so I'll be looking closely. Hopefully the Sox can lay off the splitter and get some fastballs, as Haren can be homer prone at times. Well Dice K came off the DL last night after his shoulder injury and got rocked in just over one inning of work. He is still hurt, just trying to regain form or was last night just unfortunate luck? Looking at pitch f/x data from last night compared to his other 6 home starts, we can see some obvious things. I am only using starts at Fenway so that we can be sure the data is fairly stable. That chart is showing some unfortunate news for Red Sox fans. Let us break down the clusters first. We will go left to right. The small cluster in the lower left is his changeup and splitter. The next cluster over, the biggest cluster on the graph, is his fastballs. The cluster right on the 0 for horizontal movement is his slider and cutter, and finally the cluster in the far right is his curveball. The next cluster, his slider, looks normal. So if Dice K still has any injury, it does not seem to be affecting his slider. Unfortunately, we can't say the same about his curveball. His curveball barely had any bite on it. An average curveball from Dice K has more horizontal movement than vertical anyways. In fact, it would be described as a sweeping curve. Last night, he threw 3 good curves and the rest were terrible. So after looking at his pitch movement last night, something is wrong with Dice K. His fastball did not have any life and his curveball was severely affected by the injury. OK well that looks fine. No issues there. I don't have enough knowledge about how shoulder pain affects release points according to pitch f/x, but I would have to assume that he would drop his arm slot down if he was feeling pain. So if we can assume that, we can say he wasn't feeling pain. How about this theory: He is continuing to have shoulder fatigue, which causes less velocity and prevents him from getting much movement on his curveball, but it is not a painful injury that causes his arm slot to drop. The only definitive conclusion we can make from last night's data is that there is still something bothering Dice K.
Justin Masterson gets his 6th career start tonight for Boston. Here is his pitch f/x data from past starts . Masterson has been effective up to this point, but also very lucky. He is 3-1 with an era of 2.90. Unfortunately, he hasn't been as good as those numbers show. His FIP, which is a fielding independent era, sits at 4.99. That is not a good sign and combined with a .177 BABIP, we are guaranteed to see his ERA rise quickly. The most impressive part of Masterson's game has been his ability to get strikeouts. He has a 7.84 K/9 which is fairly high for a sinker ball pitcher. As I noted in the past Masterson articles, the biggest reason for this is his devastating slider. Left handed batters only hit the pitch 57.9% of the time while righties aren't fairing much better with a 61.5% contact rate. 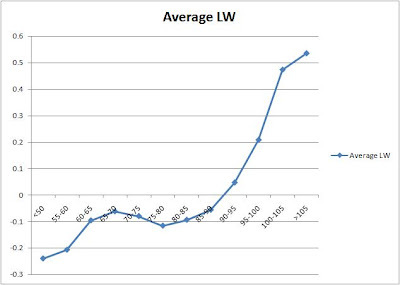 If Masterson wants to stay successful as his BABIP and ERA normalize, he will need to cut down on his walk rate. Currently walking 4.35 batters per 9 innings, Masterson will need to command his pitches going forward. I haven't posted much over the past week and a half and I apologize. I have been busy with work and some other things. Once the summer slows down I will start to pick it up again.